A struggling family cleaning out the basement of their home stumbled upon what is known as the Holy Grail of comic books ? a fortuitous find expected to save their house from foreclosure. A struggling family facing foreclosure has stumbled upon what is considered to be the Holy Grail of comic books in their basement – a fortuitous find that could fetch upwards of a quarter million dollars at auction. 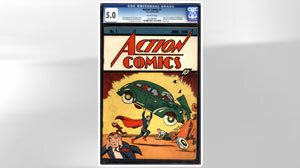 A copy of Action Comics No. 1, the first in which Superman ever appeared, was discovered as they went about the painful task of packing up a home that had been in the family since at least the 1950s. The couple, who live in the South with their children, asked to remain anonymous. "The bank was about ready to foreclose," said Vincent Zurzolo, co-owner of ComicConnect.com and Metropolis Comics and Collectibles in New York. "Literally, this family was in tears. The family home was going to be lost and they're devastated. They can't figure out a way out of this. They start packing things up. They go into the basement and start sifting through boxes – trying to find packing boxes – and they stumble on eight or nine comic books." Most of the comic books in the box were worth between $10 and $30 but one – dated June 1938 and depicting the Man of Steel lifting a car above his head – was extremely rare. That issue, which originally sold for 10 cents, is considered to have ushered in the age of the superhero. "It's a tremendous piece of American pop culture history," Zurzolo said. The couple learned online that ComicConnect.com had brokered the record-breaking sales of Action No. 1 copies for $1 million in February and then $1.5 million one month later. They immediately texted a cell phone picture to the firm's co-owner, Stephen Fishler. "You couldn't have asked for a happier ending," Zurzolo said. "Superman saved the day." Most Americans aren't so lucky. Nationwide, more than 1.6 million properties were in some stage of foreclosure in the first half of the year, according to RealtyTrac, up about 8 percent from a year ago but down 5 percent from the final six months of 2009. The couple had recently taken out a second mortgage on their home to start a new business, which failed in the uncertain economy. Mortgage payments were missed and the bank soon came after their home, which became theirs after the death of the wife's father. Fishler had to get on the phone to convince the bank to back off. "My partner basically had to explain to the bank, 'You'll have your money soon,'" Zurzolo said. "We sent them information about our previous sales and what this could realize." In a statement released through ComicConnect, the owner of the prized comic book said the family was still "a little shell shocked" after the unexpected find. "I was so nervous when I realized what it was worth," the owner said. "I know I am very fortunate but I will be greatly relieved when this book finds a new home." Last Thursday, the couple's copy received a 5.0 VG(Very Good)/Fine rating on a scale of 1 to 10. It could fetch upwards of $250,000 when it goes up for auction on ComicConnect.com from Aug. 27 through Sept. 17. While many businesses have been hurt by the recession, the comic book collection industry has received a boost. It all started in the spring of 2009, in the bleakest days of current downturn, when ComicConnect sold a copy of Action Comics No. 1 for $317,200 – a record at the time. "That was at the worst part of the recession," Zurzolo said. "All the publicity we got on that was incredible…From all this publicity people started looking around and they started finding things." There are about 100 copies of Action Comics No. 1 believed to be in existence, with only a handful in good condition. In the last year and a half, about 7 copies have turned up. "You never know," Zurzolo said. "You might have a hidden treasure in your home which can change your life." Zurzolo said more and more investors are calling ComicConnect looking for ways to make their money grow. One recent caller wanted to invest half a million dollars that he said were sitting in a bank account. "This happens to be the best year we've ever had," he said. The copies of Action Comic No. 1 that sold for $1 million and $1.5 million earlier this year had been purchased for about $140,000 each more than a decade ago. "When you tell people they might have more than a million bucks somewhere, it makes people move around and check places," he said. "In terms of the prices we've been able to realize, I do think that ties directly to the economy. You're dealing with a time in history when people are very uncertain about the stock market. They are extremely wary of the real estate market. They're making absolutely no money in their bank accounts." After discovering their small treasures, many people want to remain anonymous – like many lottery winners. "People don't want people knowing how much money they have," Zurzolo said. "Some people are very paranoid."